Cliff Garret (Norris) is a no-nonsense cop. When his former partner, Delaney (Parks) tries to kill him because Delaney is actually evil, he thinks he can go on with his criminal life. But what Delaney didn’t count on is that Garret is too tough to die, and he survives. Three years after the incident, Garret is now known by the name Grogan and is working undercover in the mob. Sure, his mullet is a little longer and he wears a bolo tie now, but he’s still the same guy - the type of guy that hates criminal scum. So he cleverly sets the Italian, French and Iranian gangs against each other. In the midst of all this violence, he takes a young boy under his wing. At first he helps Timmy (Grant) build model airplanes, but at the slightest mention, Garret starts teaching him Martial Arts so he can take on the local bully. So he has a sensitive side, but when Delaney comes calling once again, he’ll be put to the ultimate test. Will he survive? The Hitman is one of the better Chucks we’ve seen to date. It’s not boring and stodgy like a lot of his other work. 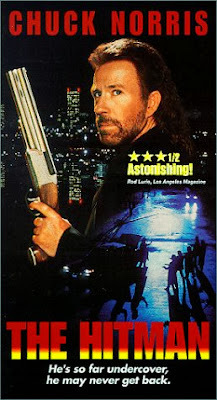 It has a nice pace, some classic early-90’s political incorrectness, good action scenes, and Chuck has plenty of winning one-liners. Michael Parks is also great as the baddie. 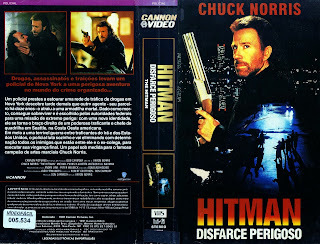 He makes a perfect foil for Chuck, just as he did for Charles Bronson in Death Wish V: The Face of Death (1994). There are some great “hero shots” of Chuck as he triumphantly appears, looming large on your TV. His long red hair may make you think he looks like a male version of Wendy (from Wendy’s), but you’ll be rooting for Chuck all the way here. 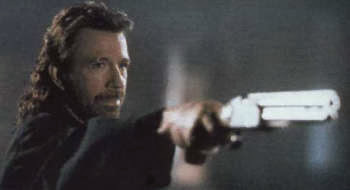 A fun thing to do while watching a Chuck movie is, during a dialogue scene while the person who is not Chuck Norris is speaking, keep your eyes trained on Chuck when he’s not talking. His “listening” or “reacting” facial expressions are priceless. That aside, both he and Parks go line-for-line in the dialogue department, and you know Chuck is serious when he wears his bolo-less bolo tie. Yes, he somehow invented a way to wear a bolo tie with no actual bolo. Now that’s innovation. But you know he’s a sensitive guy at heart because he builds model airplanes and goes to the aquarium and gives facts about dolphins (although he should know better than to tap the glass...even when he’s trying to be sensitive he can’t help being a little bit aggressive). Another thing we liked about the movie was the jazzy, downbeat musical score. That and the dark cinematography seem to indicate that this a serious, adult Chuck movie for the 90’s, not any kid stuff. We certainly appreciated that, and the violence (including the time-honored Final Factory Fight) would underline that even more. It would appear to contradict the new “PG-13 Crusader” that Chuck has become in recent years. Anyway...Marco Luganni (Waxman) is the head of the Italian mobsters, and he commands what we dubbed the “Beard Patrol” because it seems all his consiglieri are beardos. Is that a requirement for being in the Luganni gang? Also we noted the movie was ahead of its time, as two of its principal concerns are bullying and Iranians, two things heavily in the news today. Just call him Norristradamus. The Hitman is an entertaining and audience-pleasing movie, completely in keeping with the action product of the early 90’s. In other words, it’s totally worth seeing. I completely agree with your review. This is Norris's last classic. I always thought this movie felt like a late-80s Bronson movie, and just now read on IMDB that it had actually been written for Bronson. 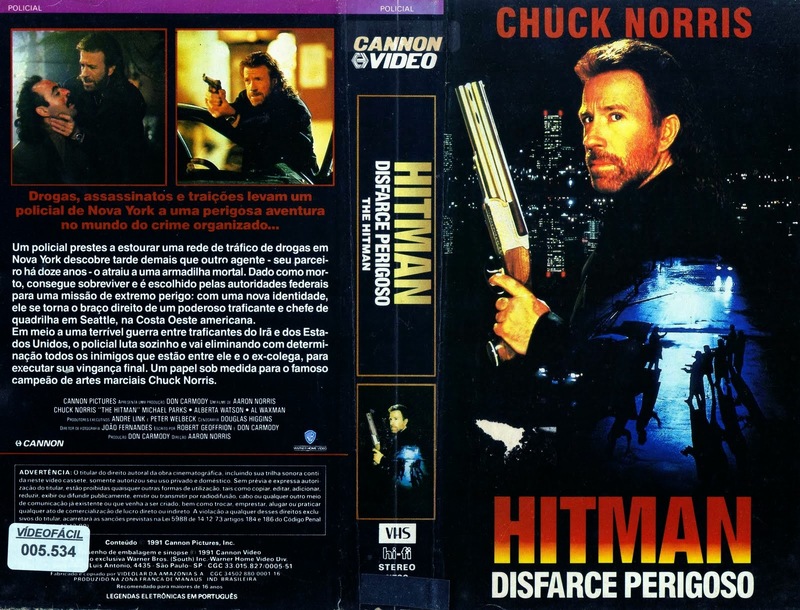 A baffling question: Why hasn't Hitman been released on widescreen DVD? Totally agree about this being the last really good Norris. That makes sense, it looks like a Bronson flick. It should be on Widescreen dvd...might as well buy the tape, if it's going to be in Fullscreen. Hitman is a solid Norris actioner, liked the dark cinematography as well. Happy you liked this too. Chuck should make more like it. This along with Delta Force 2, Missing in Action 3, and Invasion USA is some of Norris's finest work. I'd be interested to see your thoughts on The Cutter and both President's Men films. Totally agree with your choices. We do have a short review of The Cutter on the site. Haven't seen the President's Man. The Iranian restaurant scene is one of my favorite Chuck moments. I think this particular scene is definitely one of the main inspirations for the Chuck Norris facts meme. Can't agree more. Chuck at his best.